But as Kim Cook pointed out, no George Stace can be found in Horsmonden in the early 1860s, and it’s not at all clear which of several Richard Fuggles is the one that should be credited with propagating and promoting that eponymous hop, since none of them fits the required hole particularly well: they were either too young, or not in the right place at the right time. Still, we can now try to put the story right, and we can say quite a bit more about the man in whose garden that ancestor of all Fuggles first grew, since we can now point to him in census records and the like: he was a carpenter, he lived on The Heath, the little green on the south side of Horsmonden, quite near the (now gone) King’s Arms pub, he was 55 in 1861, his wife, from whose dinner basket the seed that became Fuggles fell, was called Sarah Moore (nee Dadswell), she was 42 that year, and the pair had been married 16 years. But what about Richard Fuggle? The identity of the “Mr Richard Fuggle of Brenchley” named in the article published in 1901 called “The Hop and its English Varieties” by John Percival in the Journal of the Royal Agricultural Society of England, which seems to be the source for the whole “discovered in a Horsmonden flower garden, introduced by Richard Fuggle” story about the origins of the Fuggles hop, best fits the Richard Fuggle who was son of Thomas Fielder Fuggle of Fowle Hall, which was then in Brenchley but is now regarded as part of Paddock Wood. However, (1) Percival’s is the same article that first seems to have called George Stace Moore “George Stace”, which means we cannot be 100 per cent sure anything it says is accurate, and (2) as Kim Cook showed, while this Richard Fuggle is the only “Mr Richard Fuggle of Brenchley” around at the time – there were at least two other Richard Fuggles in the wider district, his uncle and cousin, who lived at Old Hay, about a mile or so north of Brenchley in a detached part of the parish of Mereworth – Richard of Brenchley was only 13 in 1861, when the Fuggle hop was “first noticed” and had emigrated to Canada in 1871, aged 25 or so, and thus could not have been around to “introduce” the Fuggles hop to the public “about 1875”. Of course, one answer to the problem would be if “about 1875” is wrong. In the five years since Kim Cook wrote his piece casting doubt on the official narrative, many more old newspapers have been digitally scanned and made available on the net, and the information that can now be gathered together suggests that, indeed, 1875 is likely to be several years too late for the date when the Fuggles hop was first introduced. We also have new characters to add to the narrative: the Manwaring (pronounced, as we shall see later, “Mannering”) family. There were two main sets of hop-farming Manwarings in Brenchley around the middle of the 19th century, the Cowden Farm family and the Marl Place (today Marle Place) family, who moved in to Marl Place in 1850 after the death of Ann Fuggle, widow of their relative Thomas Fuggle, born 1775. Both the Manwarings and the Fuggles were descended from the Thomas Manwaring born in 1650, and as well as the Marl Place Manwarings living in a home previously occupied by Fuggles, the Cowden Farm Manwarings and the Fuggles were as tightly intertwined as hop bines: for three generations running, Fuggles married Manwarings. The Richard Fuggle of Fowle Hall credited with introducing the Fuggle’s hop was in the unusual position of having the same man, the Thomas Fuggle born in 1743, as both his paternal great grandfather and his maternal great-great grandfather. All this is a Manwaring growing another Brenchley hop-farmer’s special variety. But other Brenchley Manwarings grew Early Prolifics: in 1867 Thomas Marley of Cowden Farm (which is about a mile from Marl Place} was actually selling sets of Brenchley Early Prolific to rival hop farmers. 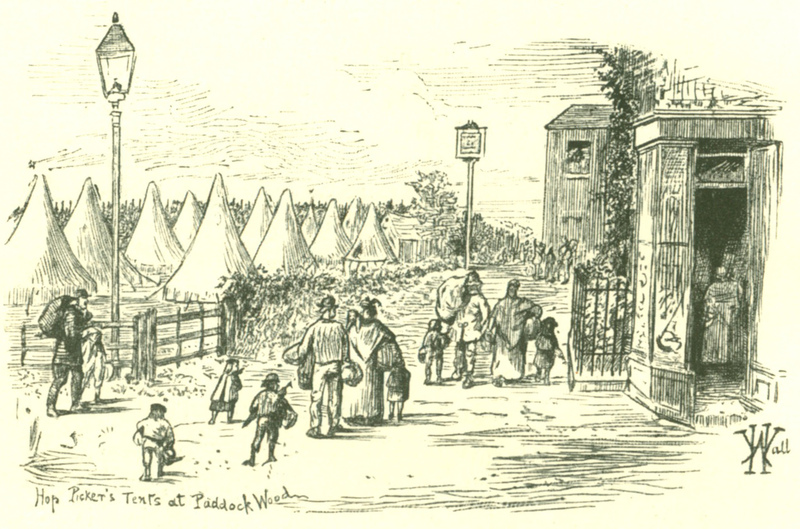 Then in September 1869 William Waterman of Queen’s Head Yard, Southwark – quite likely a partner in Waterman, Williams & Wilmot, another firm of Southwark hop factors – writing in the Hastings and St Leonards Observer, reported that “Mr Thomas Mannaring” (sic) of “Morle-place farm, Brenchley (sic again) “has been raising a new sort of hops called Cedar Goldings, which are very superior, and in the season he will have some sets for sale.” The earliest mentions of the Fuggles variety often call it “Fuggle’s Goldings”. Are “Cedar Goldings” really “Fuggle’s Goldings” under another name? Certainly I cannot currently find any other mention of “Cedar Goldings”. Six years later comes the earliest mention yet that I have been able to find of the Fuggles variety, in a report on hop growing printed in the Whitstable Times and Herne Bay Herald on February 6 1875, which said: “During the past three years there has been a great demand for all sorts of sets, particularly of recently introduced early sorts … the “Meopham Golding”, “Fuggle’s Golding”, the “Prolific” are noted types of ‘great croppers’, and their sets sell readily at good prices.” (“Fuggle’s Early Goldings” (sic) were still regarded as an early variety in 1883, according to an advert that year in the Sussex Agricultural Express, though by 1909 they were seen as a maincrop variety.) For the “Fuggle’s Golding” to be “noted” as a great cropper by early 1875, it must have been cultivated, surely, for a couple of years before that, at least. If the sources are correct, it took Mr Guest’s Prolifics seven or so years from their discovery in 1852 to become well-known enough for their quality to be mentioned in local nwspapers. 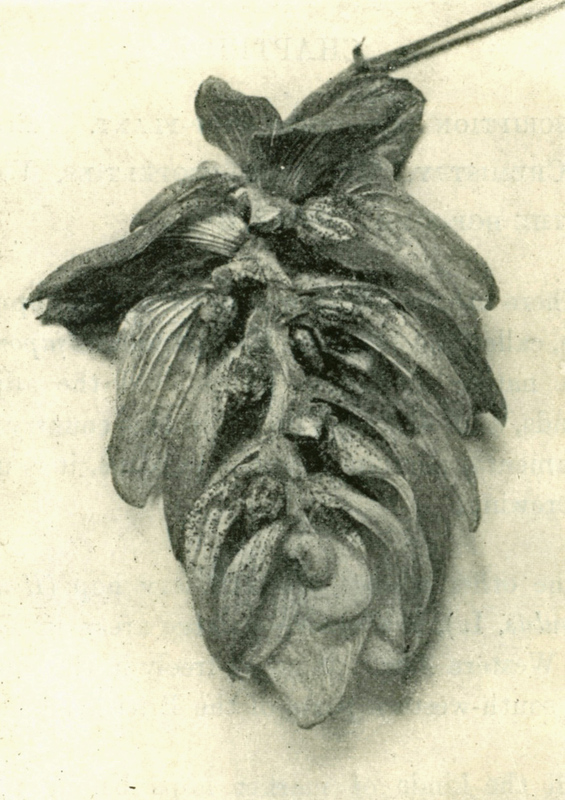 If the variety that was first spotted in George Stace Moore’s flower garden in 1861 took a similar seven years to earn a reputation as a “great cropper, that would take us through to 1868/9, when Thomas Manwaring was raising his “very superior” variety called Cedar Goldings just a mile from that same flower garden. 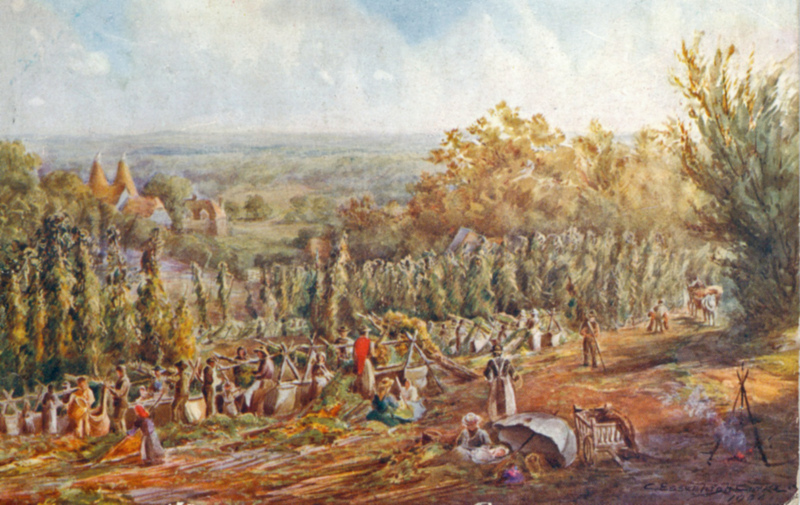 If 1868/9 is indeed the time by which the hop found in Moore’s garden had achieved a high enough reputation that others wanted to grow it, that would also mean that Richard Fuggle of Fowle Hall, Brenchley was still around to “introduce” the sets to the public, since he would not be emigrating to Canada for two or more years. We have, I think, demonstrated that the Fuggles variety must have been introduced several years before the 1875 usually given for its arrival in the public spotlight, or it would not have been around long enough to be called a “noted type” early that year. Given a minimum of two to three years for the variety to become “noted”, this pushes its introduction back to some time in or before 1871/2, but probably not earlier than 1868, given how long the Prolific variety sems to have taken to become well-known. This at least makes it possible, rather than improbable, that Richard Fuggle of Fowle Hall, Brenchley was indeed the man doing the introducing, and the man after whom the hop is named, even if he was only 25 in 1871. 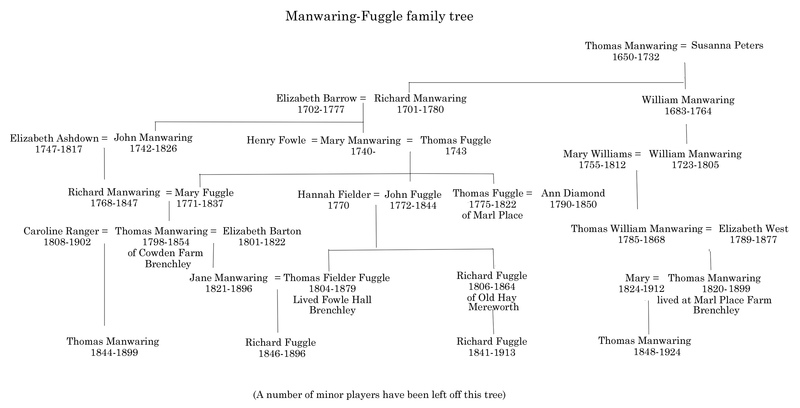 But how much of a role did the Manwarings play in the story of the Fuggles variety? It seems hugely unlikely that, as noted hop farmers living close to Horsmunden, neither the Cowden Manwarings, Richard Fuggle of Fowle Hall’s close relatives, or the Marl Place Manwarings, his slightly more distant cousins, would not have known about his involvement in the development of the plant found in George Stace Moore’s flower garden, and would not have offered advice and help. Was Thomas Manwaring’s “Cedar Golding” really the Fuggles hop under an earlier name? Did the Cedar Golding get renamed the Fuggle’s Golding in 1871 by the Manwarings to commemorate the fact that their Fuggle relative was leaving for Canada? Now I’m speculating, which is a very wrong thing. But there’s almost certainly more on this story still to be discovered as new volumes of local newspapers are scanned and made available on the web. We may yet learn the final and definitive truth about Mr Fuggle and his hop. Can I also take the opportunity to wish you a very Merry Christmas, and hope to see you in the New Year. Very insightful post. Do you mind me asking where you got the artwork featured above? 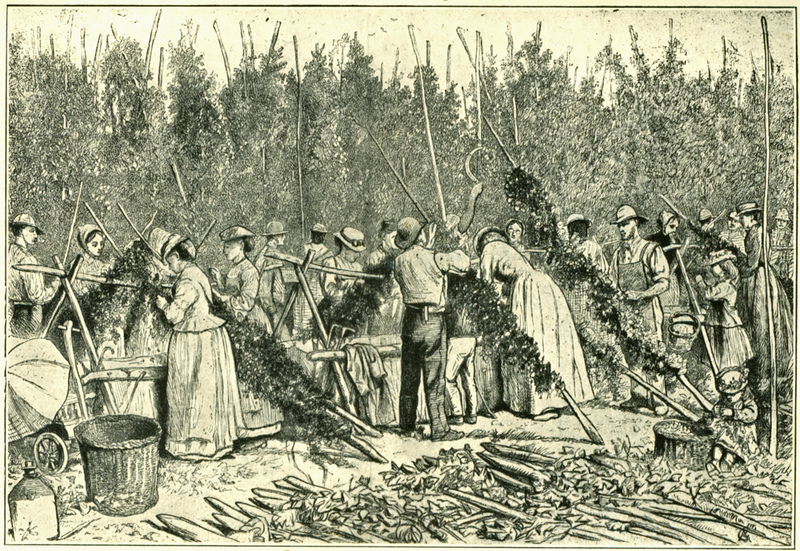 In particular, the last photo of the hop pickers from 1874? I work with a marketing agency who’s client might be interested in using a photo similar to this if we can get it in High Resolution. Please let me know – any feedback would be appreciated. Allie, it’s from a book published in 1909, and it’s actually an engraving rather than a photograph. Thanks Martyn, this was very helpful. Take care. You’re welcome, Elizabeth, and I’m delighted to have you come along and comment.